One thing a lot of you don't know is that, I have an eyelid tape snucked inside my professional kit! Why? Well, you just don't know just don't know what clients will request next! I remembered one client who asked me to turn her "large almond eyes" to "Chinky-eyes". One mature client demanded me to remove her "wrinkles" entirely. Who says being a Makeup Artist is an easy job? So this makeup artist has to be ready! I'm not saying all my clients are demanding, I'm just a good 'ol "always ready Scout"! These are super easy-to-use pre-cut eyelid tapes to help create "double eyelid" effect. What I love about these is that it doesn't look too obvious as compared to regular tapes and it doesn't shine! It has a matte finish thus applying eyeshadow on top will mask the look of tape thus giving a more natural effect! I can't show it with my eyes because I already have even lid, if I get to use these on clients, will definitely show on my AMW Makeovers portion and will post about it! (if they permit me to) So please watch out for it! 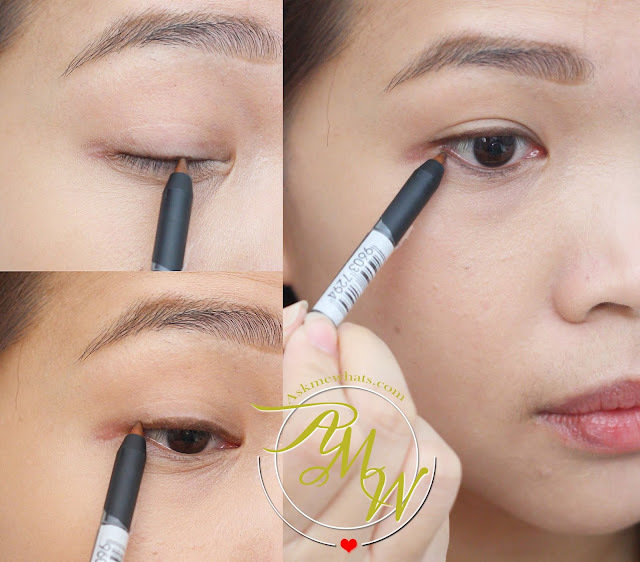 As much as we all dislike the super obvious black eyeliner especially if we have minimal makeup on, I always recommend to purchase a medium brown pencil liner for that softer and more natural-effect. Sleek Eau La Liners are creamy, pigmented and can be smudged for that "day time smoky perfection". I like how it sets and doesn't much once you set properly with a translucent powder or eyeshadow. I have always been a black and brown liner user (too boring right?) But whenever I'm in a hurry and I want to look made-up without piling up on products, I go for --- Green Liner and a bright red lipstick! The Beyond Green shade fits all skin tones! My face instantly brighten up with this matte green liner and just one application gives REAL green shade. The shade I got is light/medium and it works pretty decent on my skin. I can use this on its own or on top of makeup anytime of the day! Usually, I don't recommend using cream-based products on top of "powder" but in this case, it is an exception to the rule, I can actually use this to cover up those redness that usually appears on my cheeks mid-day. Now, a regular oil-blotting sheet is widely available in the market, and they are priced affordably. The NYX Blotting Paper is more unique with the added Tea Tree extract. It works perfect for those who tend to breakout. This blotting sheet help lessen oil at the same time, treat the skin with Tea Tree extract which is known for disinfectant property. I used to purchase all my Lucido-L Curl Lotion, and other Lucido-L hair products abroad! It took me years to do so and I'm so thankful the brand is finally available in local market. Light and Bouncy Waves - when I curl my hair and wanted it to last. Lasting Softness and Shine - on days I keep my hair straight and want it to look shiny and healthy. Airy Texture - on bad-hair days, or when I wake up with lifeless hair. This gives instant volume when I apply a small amount near the roots. Housed in iconic apple bottle (which I collect through the years), the Be Desired is a floral scented fragrance that has creamy and sensual tones. It has exotic elements like jasmine sambac and turkish rose, precious woody notes of dedarwood and amber wood making it a desirable and unforgettable fragrance. Now, these are just some of the few discoveries I've discovered for the past few weeks! Anything you recently found (beauty and non-beauty related) you want to share? I'd love to hear from you! Those Lucido L is always out of stock in SM North and I"ll check those blotting papers by Nyx. Oh yeah btw I do have recent discovery for my oily skin I've used Master Oil control facial moisturizer and my make up last until lunch time without any touch ups (usually my make up last until 10am). Hmmm the new DKNY fragrance sounds interesting. Things that I am currently obsessed with now are Ezerra Lotion (the only thing that worked on my baby's eczema) and vanicream that healed a recent allergy flare up. I have recently repurchased Ezerra and will definitely repurchase Vanicream. Both great for uber sensitive skin. Wow, thanks for sharing, I'll look into Ezerra, where do you buy them?